Product development can start at the bottom with ‘what can we do’ or at the top with ‘what do we want’. At WILLEM SMITH, we wanted a deck label that said as much about us as a deck label possibly could. It should be said that deck labels are only admired on two occasions: one is when the owner is re-arranging the seat cushions, and the other is when a guest is enjoying a sublimely comfortable sit and peers under the cushion to see who is responsible. We designed the graphic then thought to ourselves, wouldn't it make sense to laser-engrave it on our scrap leather? It’s environmentally responsible, can be colorful, has texture, looks cool and is differentiated (we’re always vying not to be more of the same). Sounds great, right? Well, here’s where prototyping comes into play. Lasering is essentially burning, and leather is skin: have you ever smelled burned flesh? Not exactly a marketing stroke of genius. So the last step in the leather deck label manufacturing process is the multi-stage hand-washing followed by eco-friendly solar drying. And because our deck labels are highly sought-after, we need to engage our canine protective services unit to keep poachers at bay. The next time you’re sitting in a magnificently-comfortable chair, check the deck or under the seat. If it says WILLEM SMITH but the label looks like an impostor, give it a whiff: if you get the genuine leather smell with a hint of singed pine cleaner, it’s an original. There isn't anywhere our mighty Francisco won’t fit, socially or stylistically. At 26½” wide with a ballerina’s footprint, you can make the world revolve around you. With a nonchalant nudge of your ankle, pivot from your ocean view back to your crackling fireplace, all the while swaddled in pi Ergonom comfort. 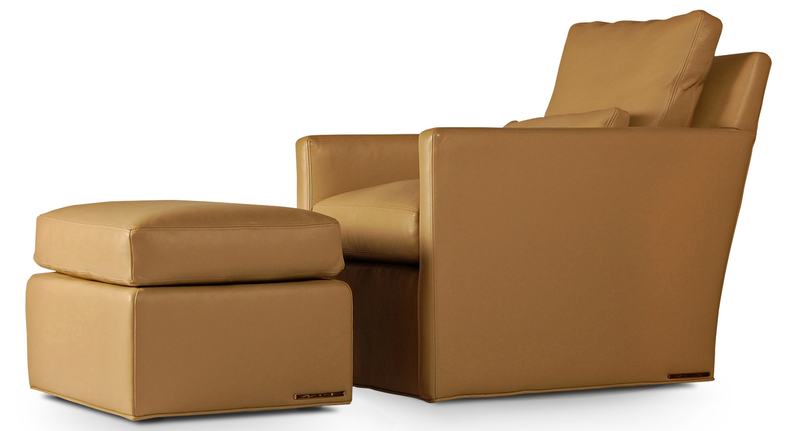 This marvel of sedentary engineering accommodates all sizes despite its cool, chic profile. Trust us. Sit it to believe it! Andrea Houck uses WILLEM SMITH’s Francisco Metro Swivel to help refashion Sandra Bullock’s childhood home. Arlington designer Andrea Houck first discovered WILLEM SMITH in the Washington Design Center several years ago. Creating a beautiful and functional home environment is a personal journey for Houck and she was immediately smitten by WILLEM SMITH’s Francisco Chair series. The owners of Sandra Bullock’s childhood home turned to Houck to pull together the final look and functionality of their rooms. For the window-lined family room that would be used daily, Houck wanted chairs that not only furthered the aesthetic but were genuinely comfortable and usable. The Francisco Metro Swivel was the perfect solution; compact and classically clean-lined yet wonderfully accommodating for all sizes and with a swivel that permits multi-directional conversation and attention. “You can count on the functionality of WILLEM SMITH pieces – they emphasize comfort and all of their furniture is extremely ‘liveable’. The quality exceeds expectations and the perceived value is fantastic. And, perhaps most importantly, my clients love their chairs.” Read more about Andrea Houck here. Thanks for reading. Sit it to believe it!